WASHINGTON (CNS) – A new study by the Center for Applied Research in the Apostolate (CARA) at Georgetown University surveyed men and women religious superiors in the United States about the possibility of ordaining women to the diaconate and found that the majority were in favor of the idea.The survey was taken in response to a papal commission organized by Pope Francis to study the question of ordaining women to the permanent diaconate. Seventy-six percent of religious superiors were aware of the commission, and 69 percent knew that it had formed and met. 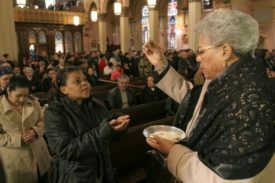 On the question of ordaining women to the diaconate, 73 percent of religious superiors believed it was theoretically possible and 72 percent thought that the Catholic Church should ordain women to the diaconate. However, they were less confident that it would happen. Only 45 percent believed that the church would authorize female deacons, and, if it were authorized, 58 percent believe that their bishop would implement it. Sixty-four percent of the superiors were at least “somewhat” aware of a history of women being ordained as deacons and 84 percent believed that doing so would create a greater call for women to be ordained to the priesthood. The superiors of women’s orders tended to doubt that ordaining women deacons would do anything to increase the numbers in their communities. Sixty-one percent thought it would not do anything to increase candidates and 18 percent were not sure whether it would or not. About 60 percent of the superiors of women’s orders said that they would consider allowing their members to be ordained. CARA surveyed all U.S. religious institutes and societies of apostolic life belonging to the Conference of Major Superiors of Men, CMSM; the Council of Major Superiors of Women Religious, CMSWR; or the Leadership Conference of Women Religious, LCWR. CARA mailed surveys to a total of 777 potential respondents and responses were collected from Jan. 26 to May 30 of this year. The researchers received completed responses from 385 religious institutes for a response rate of 50 percent which has a margin of error of plus or minus 3.55 percentage points.